Stanley Cup winner, forward and captain of the NHL's Washington Capitals Alexander Ovechkin brought the trophy to the fan zone in Moscow and spoke about Russia's chances to win the World Cup. "Football is the main sport, in our country there were many failures related to football," Ovechkin told reporters. — We progressed from the group — we were happy, we beat the Spaniards [in the 1/8 finals] — there was joy. Now we are playing with the Croats, there are chances. Very strange world championship. The national teams of Germany, Argentina were kicked out, all the favorites. Now our guys have the opportunity to win the world championship on their native land. It is necessary to support the team, do not be fooled by it. The guys are handsome, they did a great job for the country." ​The world hockey star noted that he would watch the game on TV, adding that Russia's squad knows what it is fighting for. "We must fight and try. I was at the game with Spain, I was very emotional. Not surprised by the game of the team at the World Cup. 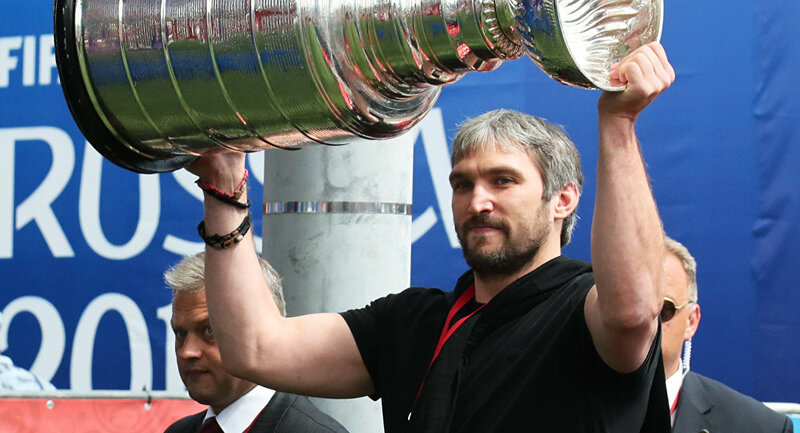 We are not so far from the finals, the guys understand this," Ovechkin told journalists at the FIFA fan zone on Vorobyovy Gory in Moscow, where he brought the Stanley Cup, which he won with the Washington Capitals this past season in the NHL. ​Croatia, who beat Denmark 3-2 on penalties in the round of 16, will face Russia, which earlier claimed victory over Spain 4-3, also on penalties, in the quarterfinals it Sochi's Fisht Stadium later on Saturday. The game is set for 21:00 Moscow time (18:00 GMT).